Cross-country ski or hike in Mount Assiniboine Provincial Park, British Columbia - a UNESCO World Heritage Site in the Canadian Rocky Mountains. We are located adjacent to Banff National Park, just two hours drive from the Calgary International Airport. A spectacular helicopter flight from a site west of Canmore, Alberta brings you to this historic log lodge on the Great Divide (the Divide forms the border between Alberta and British Columbia). 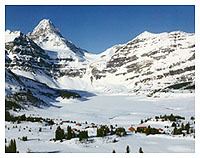 Of course, you can also hike or ski the 28 kilometres into Mount Assiniboine Provincial Park and the lodge. The lodge is situated at an elevation of 7,200 feet (2,180 meters) and is flanked on one side by towering Mount Assiniboine, Canada's Matterhorn. The lodge is owned by B.C. Parks and has been managed by Sepp and Barb Renner since 1983. 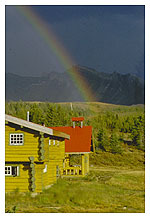 Both rustic and comfortable, Mount Assiniboine Lodge is an excellent staging point for exploring the surrounding area. The Renner's family-run operation provides affordable full-service packages at the Lodge which include all meals, lodging, guiding and helicopter access. We offer unique and personalized guided skiing and hiking experiences in one of British Columbia's most unique parks. The Lodge's guides are trained and supervised by Sepp Renner, a certified U.I.A.G.M mountain guide. This high alpine area has terrain suitable for both beginner and expert skiers and hikers of all ages. The guided interpretive programs combine participation and camaraderie with environmental education, while our historical programs present the mountain traditions and cultural history of the lodge and the park.